On the 1st of April, I left Ningbo and moved to Qingdao. I had been in Ningbo (essay 75) to fill a staff shortage at the Dipont centre there and spent a pleasant six weeks in admirable company, relearning Further Maths and applying it directly, of which I may well write in the near future. While in Ningbo, applications for work continued and interviews were carried out on the phone and using Skype (which doesn’t work well for content that matters). The interviews with Kaplan Qingdao took two hours with one person and then another hour with four in telephone conference (that worked well, actually) and I was offered the post. Then we began arguing about start date and the result of that was that I hurried directly from Ningbo, marking mock examss furiously in the last week (last day, last exam, all marked by 16:00) and rushing to pack the one case. thank heavens for C, who made the travel really straightforward. 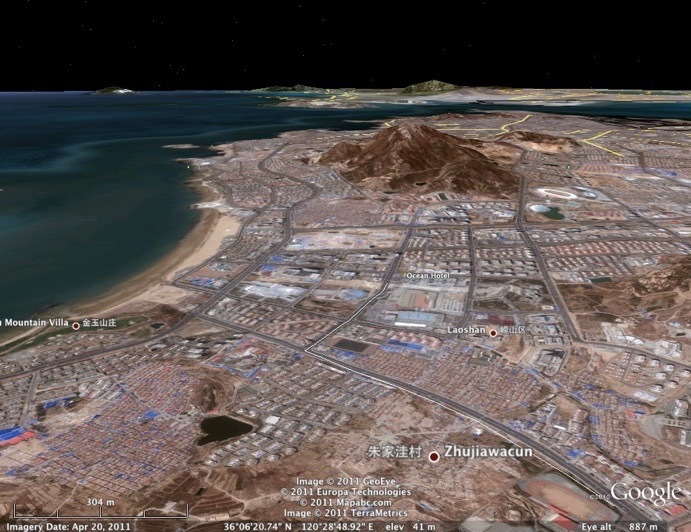 You need to know about Qingdao. I visited briefly ten days earlier—just to meet the people I might be working with, see the site, see what the problems were—and what I saw reminded me of east coast Scotland: cold and windy. What follows is my rewrite based on the Wikipedia article. Qingdao (青 (qīng) = "green" or "lush", 岛 (dǎo) = "island") is on the southern shore of the Shandong peninsula, facing into the Yellow Sea. The region has upthrust hills which sport greenery in the summer. It has a four-season year and the weather is generally milder than the continental trends, both cooler in summer and warmer in winter. The official city area is 10 thousand km² and 15% of this is highland, with the local peaks rising to 1133m. The same official area has 730km of coast and five rivers longer than 50km. The temperate weather is influenced by monsoons and puts the climate on the border between humid subtropical and humid continental, officially. Winter is cool to cold and windy, but generally dry, with a January average of −0.9 °C. Summer is generally hot and humid, but very hot days are rare, with an August average of 25.3 °C (77.5 °F). The peninsular effect delays spring and makes autumn milder than the local inland areas. 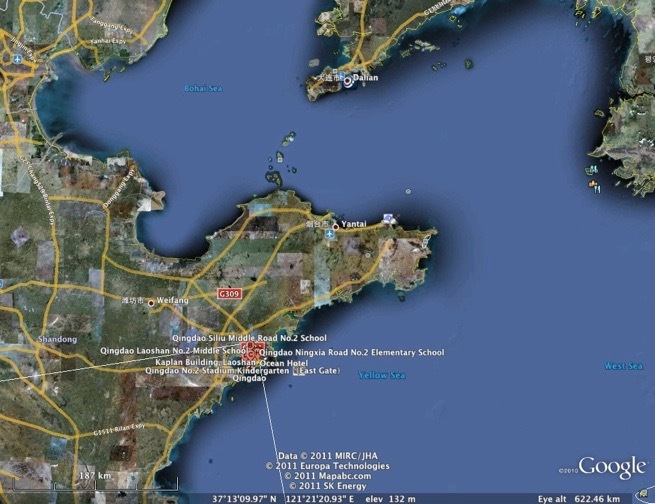 Unsurprisingly, then, Qingdao is a resort area. The city has 8 million people, 3 of which live in the urban area, so it is a similar size to Nanjing and Xi’an (and Scotland). Living standards are high, local pay is low; there is a large Korean community of 100,000 or so (only Beijing has more); TsingTao beer is made here and celebrated annually with the Beer Festival in the dedicated Beer Park (or Beer City) in Laoshan district, where I live and work. 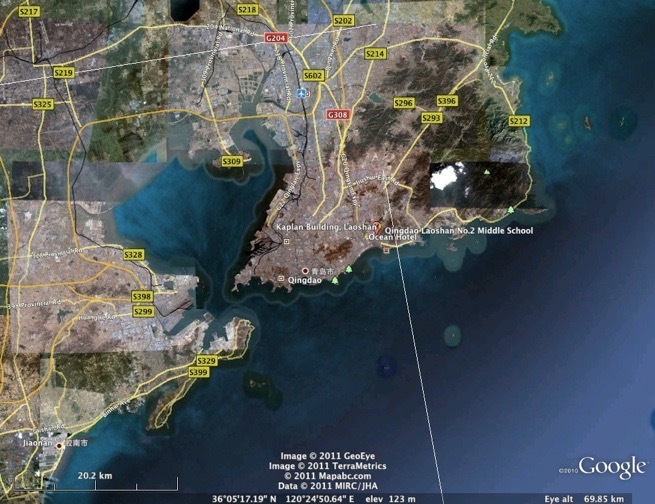 Qingdao has developed quickly and is unusually popular for further development. It boasts an airport, it is home to Haier (white goods) and Hisense (electronics), both large and popular companies in China. Part of that development resulted in a Special Economic Trade development zone, a free trade zone and a high-tech development zone. 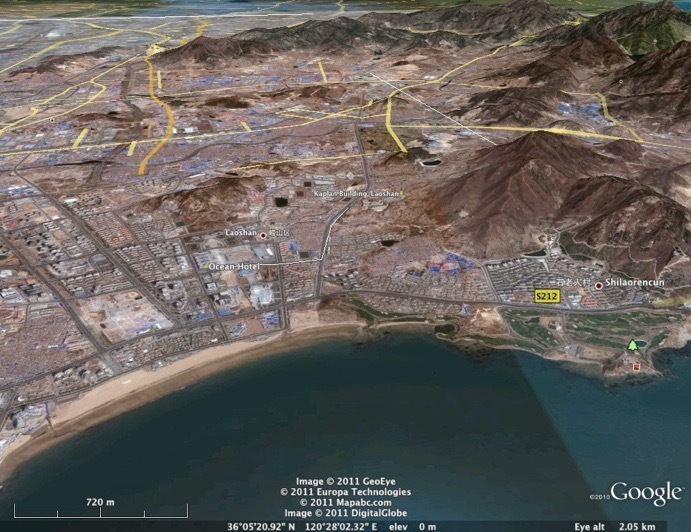 The top image from Google Earth is the Shandong peninsula, the second of just the Qingdao area. Historically, and as a result architecturally, Qingdao was occupied by German forces from 1898 to 1914, under the Kiautschou Bay concession. The Germans rebuilt Qingdao substantially, bringing wide streets, drainage, safe water, electrification and a range of other structures that last still, a hundred years later. They also brought the brewery. In the period 1914-1922, Japan took over but left relatively little visible evidence, holding the area again in 1938. From 1945-49 Qingdao was the HQ of the Western Pacific fleet of the US Navy. Modern readers may have heard of the city during the 2008 Olympics, for the sailing was held here. 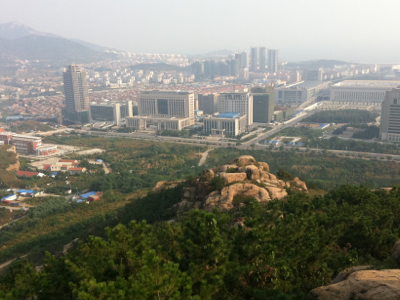 Qingdao has fine clean clear air and always has wind – the reason the air is clear, since there is quite a bit of heavy industry in the development zones. The Sailing Center (sic) is on a nice site downtown and the Olympic accommodations have turned into fine hotels – I have been to one for the theatre, itself an indicator. Sailing crew are in demand all summer (apparently) for a small daily fee. Qingdao has at least four squash courts (now there’s a rarity in China), kept open by an active, relatively rich, foreigner population. There is an active Hash (weekly meets for most of the year). There is some regular running; there is a rowing centre (not yet found). Surfing is possible in the summer (June to October, because of typhoon season). The city boasts of nine universities (Xi’an boasts 17). Festivals include the beer, the beach, hot air ballooning, fashion. The Laoshan Convention Centre (not quite equivalent to the NEC in Birmingham) is in steady use and local prices jump upwards whenever there is an influx of visitors, traffic problems following a similar pattern. I recommend the wikipedia site and exploration of the German history. Also this 3-d map from edishu. This oblique corrects the previous maps for location (like you care) and the faint white line shows the route from school to where I first lived; I now live at the corner of that route. The brown and yellow lines are major roads. Note the mountains and beach - so, yet again, I have views of mountains and water from my apartment. Here is one more looking to the city centre; see how the city flows around the mountain. I am working at Laoshan No2 Middle School, a mere couple of thousand pupils. The very top picture is taken by me from one of the nearby the hills and shows the school quite well. And shows what is meant by 'good clean air' in China.